What was it like for bee colonies before man interfered? 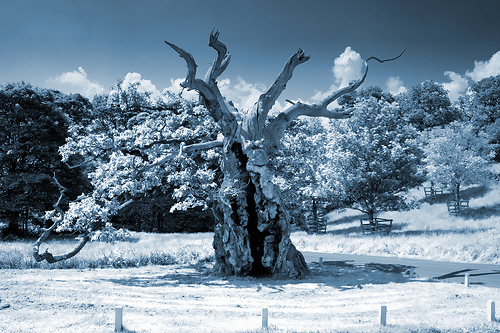 The thermal insulation provided by the hives we use today is far less than what used to be provided by an old oak tree. Our hives are typically made of western red cedar that is 2cms (3/4 inch) thick, with an open mesh floor (OMF), roof ventilation and the possibility of gaps between hive components or joints. Ignoring the negative impact of open mesh floors (OMF), our modern hives provide only about a 1/3rd of the insulation provided by an oak tree of 50cm (20 inches) diameter with 10cm (4 inches) walls around a 30cm (12 inches) diameter cavity. The 2cm (3/4 inch) walls we use are for our convenience and not for the bees. With the additional ventilation and lack of insulation provided by an open mesh floor, our modern hives are providing a very challenging environment for our bees! With a colony in an old hollow oak tree, much of the water vapour generated by the cluster would wick away on the tree debris above or below a colony and be absorbed into the tree. Instead, we are forced to use OMF floors to combat varroa and often raise the level of ventilation in the hive through placing match sticks on the corners under the crown board as we have no solution to high levels of moisture other than increasing air flow and therefore heat loss! Having explored different ways to insulate the whole hive at a level that would be equivalent to an old oak tree whilst making sure the colony has adequate levels of ventilation, we have come up with the Bee Cosy. This is designed to be fitted on a hive in winter when temperatures fall below 7C (45F).